The loop hike of these two summits has been a classic for decades. One of the most popular hikes in the lakes region, these two classic summits contains excellent views of the north and the south. To the north you can view Sandwich Mountain and some of the White Mountains. To the south lies an amazing view of Squam Lake and Lake Winnepausaukee. Mt. Morgan can be climb by the Mt. Morgan Trail, which is easy class 1 trail at the bottom, and steepens toward the top. There is side trail, which is class 3 due to a tricky ladder climb and some boulder caving that lead to the summit views. If it is very icy or if this is out of comfort level stay on the class 1 trail, which contains a moderate grade to the summit. Often the peaks is combine with nearby Mount Pervical which cares it own charming views. Though the total loop is only 4.8 miles, the amount of adventures, from ladder climbing to going through boulder caves, and breathtaking views, make these summit a must on any New Hampshire hiking plan. VIA MOUNT MORGAN TRAILHEAD: From I-93 get of Exit 24 and head east through the town of Ashland. Stay on the road and take 26 east to Holderness. At about 2 miles you will at the town center of Holderness. Make a left onto Route 113 and head roughly 10 minute on the road. there will be parking 5 miles on your left. The Mount Morgan trail will be there in the parking area. The Mount Percival trail will start on the 0.3 miles down the road on the left. This trailhead will be filled on the weekend so get prepared to park on street. VIA OLD BRIDLE PATH TRAILHEAD (To the Rattlesnakes): From I-93 get of Exit 24 and head east through the town of Ashland. Stay on the road and take 26 east to Holderness. At about 2 miles you will at the town center of Holderness. Make a left onto Route 113 and head roughly 10 minute on the road. there will be parking 5 miles on your right. VIA MOUNT PERCIVAL TRAILHEAD: Same as Mount Morgan but only the trailhead is 0.3 miles to the northeast of the Mount Morgan Trailhead. This mountain can be climbed at any time. However the mountain are much trickier in winter due to ice on the more exposed sections. As with all ladders in winter proceed great caution if you take the group of ladders to the top. 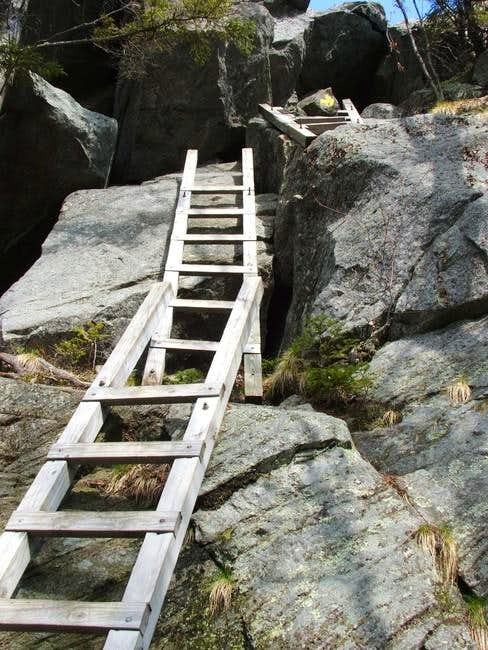 These ladders ascends a cliff and has a tricky right foot moved. There is little reason to camp at this mountain, due to the fact that the mountain is only a three hour hike. Here are some websites that will provided you the best information on conditions in the White Mountains and on Mt. Morgan and Percival. These peaks are on private land, trails maintained by the Squam Lakes Association. I just saw an online report (April 3, 2009) that the parking lot has been roped off and the trails posted as closed (presumably by the landowner and/or the SLA) due to "spring conditions". Not clear how long that will last or whether this is a regular yearly practice. Parking lots are currently open (and snow-free for the moment). There are actually three lots: one for the Percival trail, one for the Morgan trail, and one (directly across from the Morgan trail) for the Rattlesnake hills (Bridle Trail I think was the trail name) The Morse trail joins the Percival and Morgan trails very near their lower ends, so you can do the loop without any road walk. Thank you for the update. Will be updating in the Morgan and Percival page soon. No snow at the parking area; now that is shocking for this time of year!